Like the infamous Bermuda Triangle, where aircraft and ships mysteriously disappear without trace, Lake Michigan also has a place where an unusual number of unexplained mysteries have occurred. Some writers have noted these events and are dubbing the area the "Lake Michigan Triangle." When you search through Great Lakes lore by sifting through the dusty microfilms of old newspaper files, that area of Lake Michigan indeed offers its share of unsolved mysterious disappearances of men, ships and aircraft. There have been other strange happenings there as well. The triangle, if it must have a shape, is said to generally run from Ludington, Michigan, south to Benton Harbor, west across the lake to Manitowoc, Wisconsin, and back to Ludington. The shape, in my mind, however, might be more of a distorted rectangle, with one corner stretching south from Manitowoc toward Chicago. During personal research over the years I have uncovered the following oddities, mostly occurring in this boxed area of the lake. In 1937, a ship didn’t disappear but her captain did. Captain George R. Donner, skipper of the freighter O. M. McFarland, retired to his cabin after the vessel cleared the ice-choked Straits of Mackinaw and turned south through Lake Michigan toward Port Washington. When the steamer neared its destination a crew member went to Donner’s cabin to summon him, but found the room empty. No trace of Captain Donner was ever found. At least one aircraft, the Northwestern Airlines flight 2501, flying from New York to Minneapolis, also went missing over Lake Michigan in that same area. 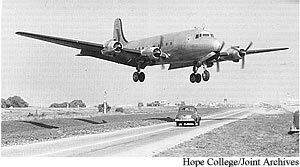 The four-engine DC-4 had 58 occupants aboard when it vanished shortly before midnight in bad weather. It was last recorded flying over Battle Creek at 3,500 feet. The only trace of the plane was a blanket with the airline’s logo on it, recovered by the Coast Guard. Then there was the story of the St. Albins, a steamer that was abandoned by its crew in sinking condition off Milwaukee on January 30, 1881. Then in late February, fishermen began telling stories about a ghostly steamship floating without a crew or smoke coming from its stack off the Fox Islands. Was the St. Albins still afloat? How could that happen? A search of the lake that spring failed to find a trace of the lost ship. What were the fishermen seeing? In the evening of Nov. 26, 1919, people in southeastern Michigan, northern Indiana, northeastern Illinois and the southeastern corner of Wisconsin witnessed a brilliant light in the sky over southern Lake Michigan. They said two large balls of fire fell from the sky into the lake, exploding on impact. This was followed by a deep and prolonged rumbling and a shaking of the earth. Many thought they witnessed a large meteor that broke up as it entered the Earth’s atmosphere. But was it that? Yet another odd aerial phenomenon occurred on July 12, 1883 aboard the tug Mary McLane, as it worked just off the Chicago harbor. At about 6 p.m. the crew said large blocks of ice, as big as bricks, began falling out of a cloudless sky. The fall continued for about 30 minutes before it stopped. The ice was large enough to put dents in the wooden deck. The crew members brought a two-pound chunk of ice ashore with them that night, which they stored in the galley ice box, as proof that they didn’t make up the story.